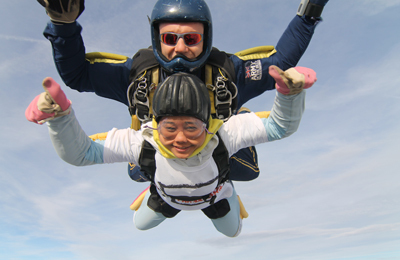 You can do a sponsored parachute jump from one of 20 different locations around the country. Just Walk 2016 Britain – Saturday 7th May 2016. You can choose 10km, 20km, 30km [new for 2016], 40 km or 60km. Also: a Twlight 10km Just Walk route. Great Manchester Run of 10km on 18th May 2016 – Europe’s biggest 10km running event. Great North Run – 13.1 miles or 5km in Newcastle on 11th September 2016 – raise £500 with a deposit of £50. Great South Run – 10 miles or 5km in Portsmouth on 25th October 2015. Thank you to Peter, who did a 60-mile charity walk on Saturday 18th October 2014 for charity, including raising funds for Burma Campaign UK. Pam Skelton, accompanied by her daughter Laura, and Lesley Mair walked 60km in the Just Walk 2013 and between them raised over £4,496 through the generous donations of our supporters. Louise Procopiou with Joshua and Emma Murphy, pictured above with their Aunt Wilhelmina, who raised £1,371 in the Just Walk 2013 for Burma Campaign UK in memory of their grandmother. Ian Fleming walked 60km in one day and raised £562.27 for Burma Campaign UK. Our thanks also go to Darren Laker who also walked the 60km route. A big thank you to all our fundraisers. 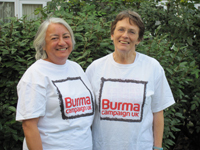 If you want to raise funds for Burma Campaign UK, you can register your own UK event here. If you are a UK tax payer, don’t forget that your donation could be increased through Gift Aid, meaning Burma Campaign UK will get even more support!